Homepage. This page: An interesting little leaflet issued by an Esso-appointed garage in the 1950s era. This freely distributed leaflet was given out by an appointed Esso service garage - Carey & Lambert Ltd, of Austin House, The Avenue, Southampton, presumably in the early 1950s. The cover shows a hatted gentleman, drawing on his pipe, driving his two door tourer into a service bay. What makes this leaflet different from all the others I've found, is that the car is mounted on a separate piece of paper to the background garage image, ie affixed to the back page, and pokes through the cover via a slot on the front page. As you open the leaflet, the piece of paper with the car printed on it slides through the slot in the front page, giving the impression of the car 'driving' into the garage. How this one survived without ripping is anyone's guess! Inside is a drawing of a cheerful garage mechanic, pointing to an Esso petrol pump. The reader is also invited to ".. test for yourself the Quality of our Service". And it continues: "Drive into this station, and get your needs supplied in double-quick time by a ready and courteous staff! No waiting at the pumps, little adjustments made with the efficiency which comes from experience, where nothing is too much trouble. The service is waiting here for YOU. You'll get a cheerful start to your day's motoring. Drive in today." Back then, service was key to encouraging customers to a garage's forecourt, and Esso and other petrol suppliers (such as BP and National Benzole for instance) were keen that the service on offer at their appointed garages was second to none. Competition was also much greater, roadside garages and filling stations were much more numerous than they are now. What a shame that this level of customer care has been allowed to slip away - cashiers may be pleasant enough at a modern filling station today, but there's little or no chance they'd be able, or willing, to pop outside and roll up their sleeves to try and fix a car's problems. And you've more chance of finding a selection of different coffees on offer, than a spare fanbelt. The fact that cars are now overly-complex, with virtually no parts interchangeability between makes and models, is probably the reason for the hands-on petrol station attendant being a thing of the past. It has also led to fewer owners being willing to lift the bonnet of their car, to effect a repair themselves. The loss of interchangeability has had a real knock-on effect on how garages can now operate. In the 1950s, a garage or filling station might for instance stock a few 7" Lucas headlamps. These lamps could be fitted to many many different makes and models of cars, ranging from a humble A30 through to a raffish XK120, to help their owner get on their way once more. Now because all parts are unique to a particular make and model, ordering parts in is the only option - not much use if you're driving up the motorway and a stone goes through your headlamp. 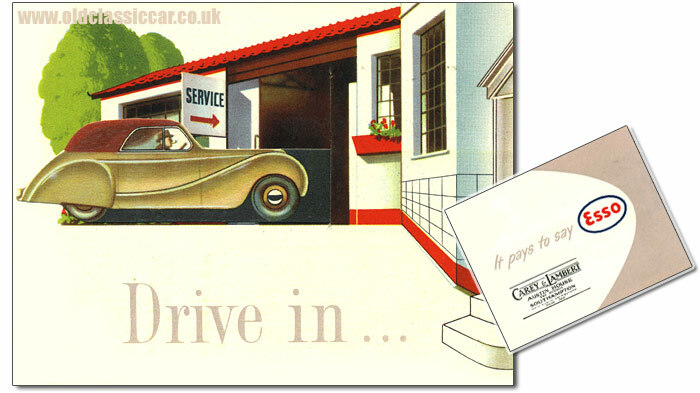 This isn't the only piece of motoring ephemera from this Esso garage to feature on the site. A handy leaflet giving tips on how to drive in winter can be seen here, as can this one, explaining all the services that Carey & Lambert Ltd could offer.